Being the new guy around here, I wasn’t too sure what all the hullabaloo with these short film contests was all about. Do people really enter? Are the entries any good? Do I have to watch them all?!? I mean, yeah, I’ve heard a lot of buzz about the contests and a short I produced had entered (and didn’t even make the second round!) last fall so, I was a bit worried about the whole situation. Well, I’m no longer worried. Not only did filmmakers show up en masse to enter the contest, all the entries were really, really good! So good that I frequently found myself glad I wasn’t the one making any final decisions. That went to our esteemed panel of judges who I’ll re-introduce before getting down to the nitty gritty. Yen Tan: This Malaysian-born and Austin-based filmmaker is a writer, director and graphic designer. His award-winning films have screened at festivals worldwide and picked up video and theatrical distributions. His last feature, Pit Stop, premiered at Sundance 2013 and was nominated for a John Cassavetes Award at Independent Spirit Awards 2014. Tim League is the CEO and founder of the Drafthouse Cinemas and Drafthouse Films. Ahmed Khawaja: The winner of our winter shorts contest with his short film Best Friends, Ahmed was born and raised in Abu Dhabi, but is an Indian. He makes movies about himself, his family, and friends, but wishes that one day he’ll be able to make his first legit feature film, a sci-fi Comedy called Fly Me To Kepler 22-B! IFFBoston, Maryland Film Festival, Nashville Film Festival, Montclair Film Festival, Sarasota Film Festival, Hamptons International Film Festival, Oak Cliff Film Fest, Sidewalk Film Festival, St. Cloud Film Fest, SF Indie Fest, Napa Valley Film Festival, Austin Film Festival and the Lone Star Film Festival. Thanks to you all! Here is the aforementioned twist: we usually try to only have one runner-up. But alas, this funky little documentary short won the hearts and minds of all judges who watched it so there’s two runners-up! Directors Statement: In 1988, my Paw Paw Charles took his video camcorder to Collinsville Trade Day to document the popular outdoor market for posterity. 26 years later, I found the tape buried in a box in his living room closet. I edited his footage and the resulting film is a very personal collaboration with my grandfather about a small town’s culture. Indeed, Collinsville Trade Day, 1988 is, as judge Tim League stated, a “wonderful little time capsule snapshot” of a time that really isn’t that long ago. Heck, I was a senior in High School when this was made and granted, I didn’t grow up in rural Alabama, but I don’t remember shorts being quite that short. I do remember a lot of mullets though and may have sported one myself. But this short isn’t just a knee-slapping look at bad fashion and questionable items for trade, it’s also kind of….poignant by the time it wraps up. I know I felt a kind of pang for a simpler time when someone walking around with a video camera was a rarity and not everyone was posing or posturing. There’s a real truthiness to this film that gives you a cozy yet kind of sad, nostalgic feeling. It was a real treat to watch as you will see. Making Eyes was quite the little red herring in the mix of awesome shorts we received. At first it looks a little simplistic, a little raw…a little chincy. But damn if it doesn’t draw you in and stick with you. I found myself wondering if it really was as interesting as I thought it was or the fact it was just so odd was giving me cause to reflect on it after it was over. Maybe it really wasn’t that good but was just so different it pulled me in? Frankly, I’m still not sure what it is about this film so I’m just going to go with: it’s a good movie! It’s imminently watchable, it’s fun and it’s a bit unsettling as well. Our judges agreed. Directors Statement: Here’s Making Eyes, a short I made last spring in Bed-Stuy Brooklyn with friends. It’s my first proper movie since making this a few years ago and I’m excited for y’all to check it out! Inspired in part by early Mike Leigh and my degraded downloaded copy of Bresson’s Four Nights of a Dreamer, Making Eyes is a strange little movie shot on a hi8 camcorder. I didn’t go the festival route, mostly because I was concerned I would spend a year mailing checks off to a bunch of places that might not considering playing a movie that looks like this. So, yeah. Making Eyes is a quirky little gem made on a hi8 camcorder which again, gave me pause. Is this a gimmick or a choice? And again, in the end, does it matter? It works! The low-fi look coupled with well-staged, sometimes lovely shots, bring it all together and the uneasiness portrayed by lead actor John Beamer is downright palpable. I love this short and I was so happy the judges put it forth as a winner! Again, there were some truly amazing shorts submitted to our spring ’15 contest but Michael Tyburski’s Actor Seeks Role immediately leapt out ahead of the pack. It’s a fully realized, well shot and brilliantly acted short film that you’re probably going to see at numerous film festivals for the next few years. And with good reason– it’s outstanding. Paul (Alex Karpovsky) plays an actor struggling to master his art. He takes intense classes, goes on (and is routinely rejected at) auditions yet, he keeps plugging along. 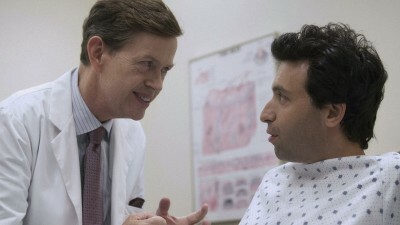 Only one person seems to truly believe in him and see his genius– a doctor at a local medical college named Friedman (Dylan Baker). Yes, Paul is Friedman’s own personal ingénue who is masterful at portraying symptoms that never cease to throw off the eager students in class. Starved for the attention and accolades Friedman lavishes on him, Paul aims to please by going full-on method each night in terms of learning the physical ailments that Friedman has assigned. But as with any obsessive artist, how far is too far when it comes to dedicating oneself to their craft? Actor Seeks Role is the real deal. It’s a very well realized short film that had the good fortune to land two spectacular character actors in Karpovsky and Baker. Another great thing about this short is that it seems to truly exist as the short that is presented. That is to say, it’s not too much story shoved into a small constraint nor does it drag on. It also doesn’t feel open ended, like a short film which is really a few scenes culled from a feature the filmmaker wants to get made based on the success of the short. Not that there’s anything wrong with that, but I found it refreshing to see a short film that fully takes advantage of it’s time constraints and uses them brilliantly. Unfortunately for you, dear readers, filmmaker Michael Tyburski asked that we only show the trailer for the film as he’s planning a big online release for the film this summer. We will be sure to let you know where and when you can see the film in it’s entirety. So there you go, the winner and runners-up for our Spring 2015 short film contest. And if you weren’t quite ready this time around rest easy, we’ll have a new contest for the summer coming up soon so, stay tuned….